This is an awesome new musical app which is sure to help you belt out some beautiful Christmas carols of the festive season. With a range of features designed to help you find your voice and sing perfectly in pitch, this app for iPhone and iPad has everything you need to transform your voice in no time at all. As someone who has been singing since childhood, I can always tell when a singing-related app is redundant or if it is going to be of some use. This is definitely a great example of the latter, although you might get sick of the Christmas songs by the time February or March roll around! The developer is promising more songs coming soon, so I this app definitely receives a very strong recommendation from me. When you first start using Free singing coach, songs, voice exercises, by Sing Sharp, I would suggest starting by checking out the Vocal Range section. This features a tool which measures your highest and lowest notes so that you can identify the full extent of your range. A word of warning here: try not to strain your voice doing this, and if you are going to really try and extend your vocal range, be sure to warm up thoroughly. Furthermore, don’t do anything that feels strained or painful in any way as this could negatively impact your voice in the long-term. I would also recommend placing an emphasis on keeping your tongue as relaxed as possible to free up the muscles in the back of your throat. This will really help you to project your voice and enunciate without tensing your vocal chords excessively. Once you’re all warmed up, it’s time to start singing some songs, and for now there are eight songs for you to choose from, all of which should also help to get you and your family into the spirit of the holidays. You’ll find titles such as Amazing Grace, We Wish You a Merry Christmas, and even Auld Lang Syne. 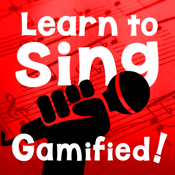 Free singing coach, songs, voice exercises, by Sing Sharp is a great app, and the perfect festive addition to your iPhone and iPad for the holiday season.